Ravenscar veteran Will Warwick wrapped up his 900th club wicket as he took 5-24, including a hat-trick, in his side’s defeat against Wykeham B in Division C.
Warwick’s superb spell helped skittle Wykeham for just 123, but George Shannon then took 3-12 as Ravenscar fell away to a miserly 67-8. Flixton B went level on points at the top of the table after they hammered Forge Valley B by 10 wickets. Valley posted 151-2 as Tom Varey (77no) and John Flinton (42no) steered their side to a respectable total. That proved to be below-par as Elliot Hatton (87no) and Finlay Ward (52no) safely steered Flixton to their target without any loss. Leaders Staxton B were stunned by eighth-placed Scalby B.
Skipper Chris Malthouse hit 43 and Tim Barton 25 as Scalby posted 148-3, which proved more than enough as Staxton replied with 102-5, Dave Aldcroft hitting 30. Snainton cruised to a nine-wicket win at home against Cayton B.
Snainton then cruised to 92-1, Ben Norman hitting an unbeaten half-century and Michael Kipling also remaining on 34 not out at the other end. 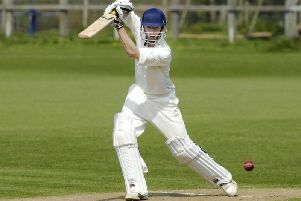 Ashley Fothersgill smashed 76 in Ebberston B’s win against rock-bottom Muston. Fothersgill’s knock was ably supported by 62 from Tom Holmes as Ebberston posted 166-5 before George Hardie’s 4-26 helped ensure Muston were all out for just 84 in reply. Aaron Howard hammered an unbeaten century but that wasn’t enough for Division A leaders Filey to beat Ganton, the table-toppers falling agonisingly one run short of victory. James Pick hit 75 and Alastair Limb 35 not out in Ganton’s 154-3, Howard then smacking 100 not out in Filey’s reply, with the hosts falling desperately short on 153-4. The chasing pack all took full advantage of Filey’s slip-up. Second-placed Seamer beat Wykeham by 64 runs to close the gap to just two points. Aussie Mitch Fisher (37) and Josh Broadhead (35) steered Seamer to 169-7 before pace bowler Sam Park claimed 4-18 as Wykeham slipped to 105 all out. Heslerton remain in third spot and firmly in the title hunt after beating Ebberston by eight wickets. Only Tom Brickman got going with the bat for Ebberston, top-scoring with 28 in their 101-6. Heslerton made light work of their chase, Sam Triffitt hitting 50 not out and Kristian Wilkinson 29 not out as they cruised to 102-2. Champions Staxton stay in fourth place after edging past relegation-threatened Scalby. Linden Gray hit 41 and Kiwi Matty Jones in Staxton’s 122-6, Scalby’s Aussie spinner Lachlan Cooke claiming 4-38. Despite youngster Ed Hopper hitting 48, Scalby fell away to 93-6, Kyle Outhart taking 3-14. Cayton A stayed on course for the Division B title after a comfortable six-wicket success at home to Cloughton A.
Cloughton posted a well below-par 81-7, Aaron Virr hitting 25 as Josh McNeill took 4-24. Aussie James Small then hit 32 not out and Adam Robertshaw added 32 as Cayton made it to 82-4. Flixton kept up the pressure on the leaders with a 47-run win at home against Forge Valley A. Will Hutchinson’s 3-7 helped restrict Valley to 94-6 replying to Flixton’s earlier total of 141-7, Harry Walmsley and Chris Mann both making 26, Matty Nettleton taking 3-40. Scarborough eased their relegation fears with a seven-wicket win at Seamer B.
Dan Jewitt hit 45 and Sam Collinson 28 in Seamer’s 120-7, Andy Exton taking 4-13. David Snowball then made 63 not out and Tom Pratt 33 as Scarborough cruised to 121-3. Cloughton B closed the gap on their A team with a six-wicket win against Sherburn. Ben Briggs (33) and Jack Pickard (28) helped Sherburn to 127-6, Ben Rowe taking 3-29. Cloughton then cruised to 128-4, Rowe hitting 31 and Scott Wardman 25.